That rosy tomato perched on your plate in December is at the end of a great journey--not just over land and sea, but across a vast and varied cultural history. This is the territory charted in Fresh. Opening the door of an ordinary refrigerator, it tells the curious story of the quality stored inside: freshness. We want fresh foods to keep us healthy, and to connect us to nature and community. We also want them convenient, pretty, and cheap. 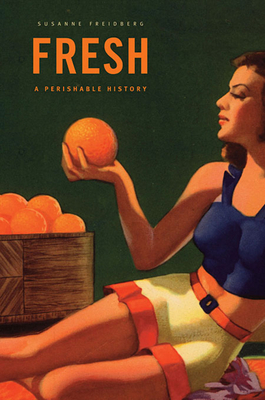 Fresh traces our paradoxical hunger to its roots in the rise of mass consumption, when freshness seemed both proof of and an antidote to progress. Susanne Freidberg begins with refrigeration, a trend as controversial at the turn of the twentieth century as genetically modified crops are today. Consumers blamed cold storage for high prices and rotten eggs but, ultimately, aggressive marketing, advances in technology, and new ideas about health and hygiene overcame this distrust. Freidberg then takes six common foods from the refrigerator to discover what each has to say about our notions of freshness. Fruit, for instance, shows why beauty trumped taste at a surprisingly early date. In the case of fish, we see how the value of a living, quivering catch has ironically hastened the death of species. And of all supermarket staples, why has milk remained the most stubbornly local? Local livelihoods; global trade; the politics of taste, community, and environmental change: all enter into this lively, surprising, yet sobering tale about the nature and cost of our hunger for freshness.